Brussel Sprouts. Baked in a cheese sauce. With bread crumb topping. If you're a Brussel Sprouts fan, your ship just came in. Wait, though: we took this incredibly healthy vegetable -- and kept it healthy! Even with the cheese sauce and the bread crumbs, this dish is still only 2 Weight Watchers PointsPlus® per cup / 150 g serving. So tuck in and just enjoy. Bonus: it's quick and easy to make with one little cheat on the sauce. Spray the inside of a 2 litre / 2 quart casserole dish with cooking spray. Set aside. Empty the sauce mix into a microwave safe jug or bowl. Disregard package directions and instead measure 1 1/2 cups (12 oz / 350 ml) of water. Add a small amount of that water to the sauce mix, whisk to make a smooth paste, then add the rest of the water and whisk till smooth. Cook in microwave for 2 to 3 minutes until thick, then set aside to let it thicken some more as it stands. Start heating over to 175 C / 350 F.
Transfer the cooked sprouts in a large bowl or pot. 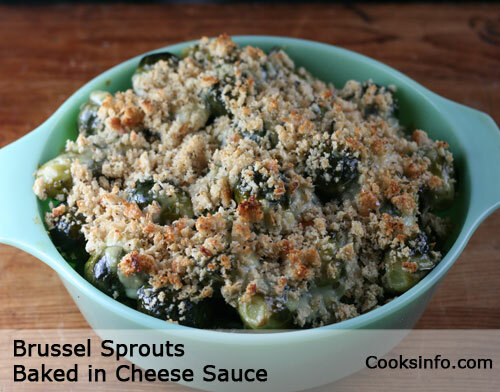 Add the cheese sauce, mix carefully until all sprouts are coated with sauce. (If the sauce got too thick, you can whisk in a bit more water.) Put in casserole dish. Bake for about 35 minutes or until piping hot and bread crumbs are golden brown. Brussel Sprouts cooking times: Boil small to medium-sized ones for 5 minutes, large-sized ones for up to 15 minutes. Or pressure cooker: 6 minutes for small to medium ones, 12 minutes for large ones. You can make this up to a day ahead; store covered in refrigerator and remove from fridge 1/2 hour before baking. 2 Weight Watchers PointsPlus® per 1 cup / 150 g.
There are a total of 22 Weight Watchers PointsPlus® in the recipe, which makes for 2 points for each of the 9 servings. We used bread that was 1 Weight Watchers PointsPlus® per slice. The points break down as follows: 0 for the fat-free Italian dressing, 2 for the bread, 4 for the sauce, 16 for the Brussel Sprouts.